A look at the 13 different zip codes in Mesa shows homes in 85213 have the highest median sales price for homes sold in January ($335,000), followed closely by 85207 at $330,000 and 85212 at $308,945. As we’ve said in the past, looking at one month’s data can skew the results since there isn’t a lot of data to compensate for the “outside of normal” things that happen in any given month. We might have a slightly different picture if we looked at quarterly or annual data instead. That being said, it’s clear that 85207 and 85213 are the most desirable zip codes in Mesa, while less expensive homes can be found in 85201, 85204, and 85208. 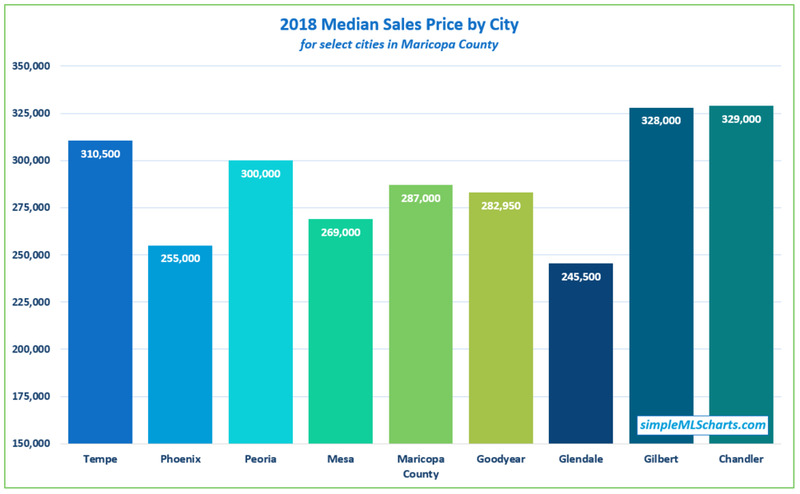 The median sales price in Mesa was $269,000 in 2018, up 8.5% from $248,000 in 2017, and up 136% since the bottom of the dip in 2011.